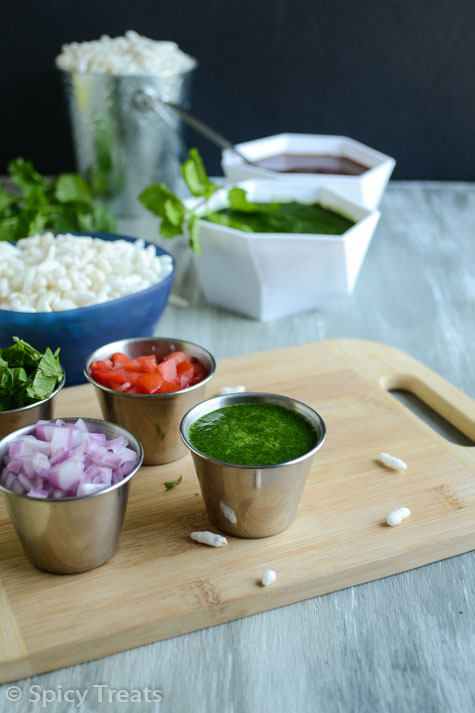 Today's recipe simple and easy to make chaat chutneys which is one of the main and common ingredient in most of the chaat recipes like Bhel puri, samosa chaat, paani puri, Dahi puri, aloo patties, cutlet chaat and the list goes on. Dunno why i did not post any chaat recipes here except the Papdi chaat that too a fusion - South Indian popular street food - Thattai set with North Indian chaat chutneys, a must try snack. Next time you make papdi or buy papdi don't forget to try this refreshing and yummy snack. Chaats are my most favorite snack and i love all kind of chaat foods. 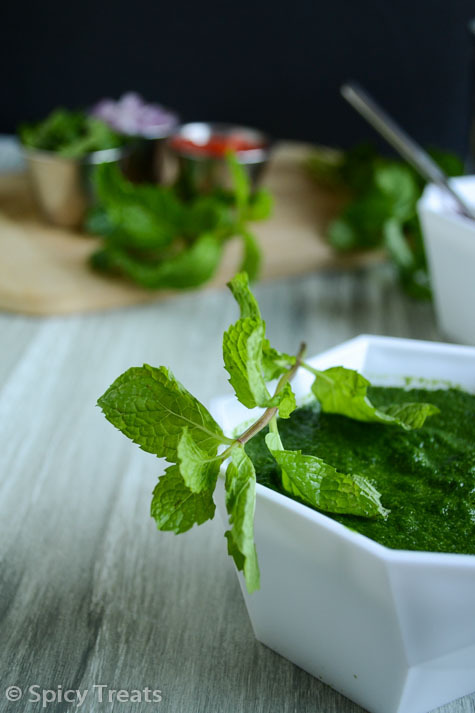 Chaats are tongue tickling, refreshing and filling snack. It makes me more happy and fresh and i have no words to describe my love for chaats. I often make them but i don't have patience to click and instead my mind order me to finish the whole platter. So i did not post any recipes so far and now Vardhini's event pulled me to make and share some recipes here. Thank You Vardhini :) So friends & readers keep watching for more chaat recipes to follow. This can be done using dates and without dates also. I used dates here. 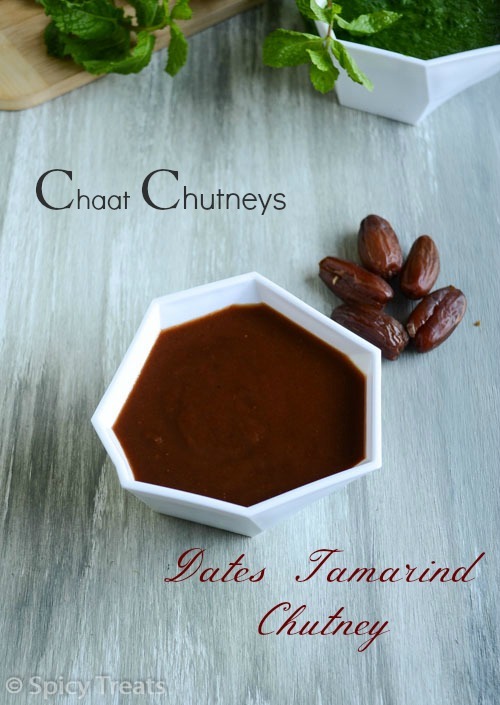 Cook Tamarind and dates in a pressure cooker or in open vessel until it is soft n mushy. Then cool and grind it in a blender and filter the tamarind-dates mixer and keep aside. 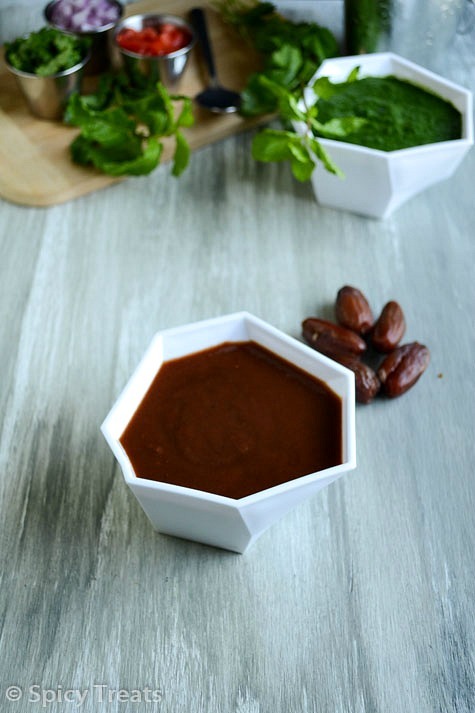 In a sauce pan, add 2 tsp water and add the powdered jaggery and cook till dissolve and when it starts boiling add the tamarind dates extract ,little water and stir well . Now add chilli powder, cumin powder, black salt and allow to boil for 2 min. That's it..Dates Tamarind chutney is ready. You can store this chutney in refrigerator for even a month. Love these chutney's Sangeetha! Looks too good! love dat bowl..so cute.n really nice cliks..these kind of chutneys r very useful..good post.. Very perfectly made chutney........looks so inviting. nice chutney and lovely clicks!!! I read a lot of food blogs and we Indian's are the only people who comments on the pictures instead of trying the recipes and then commenting!! I would always try the dishes then comment which gives the confidence to other people who would like to try them. 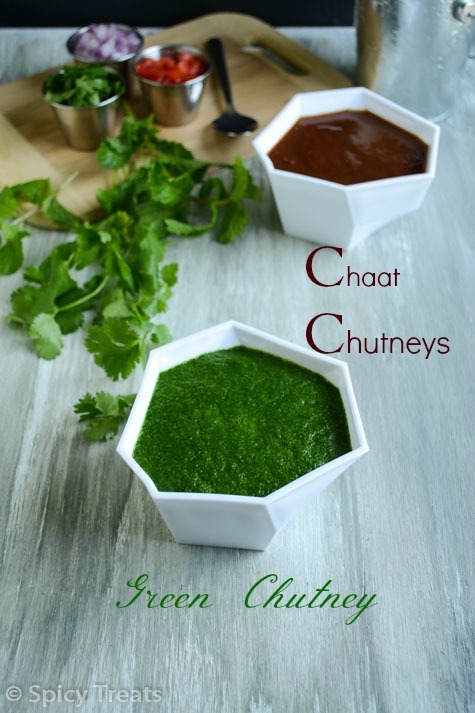 yummy and delicious chutney, loved the pics. 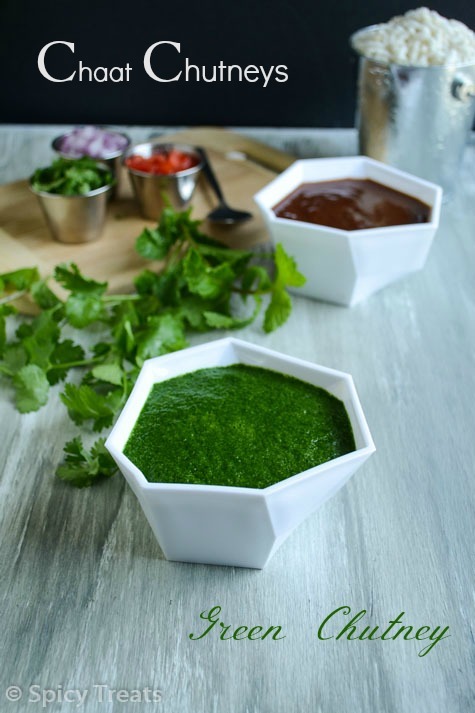 I cant imagine chaat foods without this both chutneys..Am eager to know wat is next chaat food u r going to post here.. I just tried these chutneys for my bhel puri. It came out awesome!